Hold onto your hats, because it's almost 2019! Even though the passing of another year signals that we're all getting a little bit older (*groan*), I very much enjoy celebrating New Years. It's an excuse to start fresh, a good reason to celebrate the future, and a time to reflect on all the awesome things that happened in 2018. To ring in the new year, I made a cute little banner to hang in my home. It took no time at all to make, and the cost was almost nothing, since it's made mostly from inexpensive felt. Make one to bring good vibes in 2019, or to hang up at your New Year's Eve party! When did we all decide to stop wearing ugly Christmas sweaters ironically, and switch to wearing them sincerely? Either way, I love a good ugly sweater during the holidays. The tackier, the better, in my opinion! I have my own that I whip out for parties, decked out in kittens and distractingly noisy jingle bells. I decided to celebrate this kitschy theme by making a decorative garland out of mini little sweaters. Turns out, shrinking things only makes them cuter, not uglier! Every winter, it's the same story. I get a handful of thoughtfully selected, lovingly written cards for the holidays...and, I have nowhere to put them. Tacked on the fridge with the grocery lists and unpaid parking tickets? Jammed on a shelf between the dusty knick-knacks and piles of unopened mail? Ok, my house isn't THAT disorganized (most of the time), but I'm sure you feel the pain of receiving beautiful mail and having nowhere to display it. This year, I decided to take matters into my craft-loving hands and make a simple, pretty DIY branch holiday card display. It only requires a few basic supplies to make, can be made as small or as large as you want, and will make your home smell like a pine tree, which is obviously the best reason to make your own. Keep reading to see how to make a DIY branch holiday card display! A few years ago, super chunky knit blankets started popping up on blogs and Pinterest, and I immediately knew I wanted to knit my own. Mine knit up quite quickly and easily, and I've been enjoying its cozy embrace ever since. Now I'm even considering putting one of these kits to knit another on my Christmas list, partly because my cat thinks that the one I made should be reserved soley for her use. But also because I'm really not sure you can have too many of these luscious chunky knit throws. Ready to test that hypothesis? 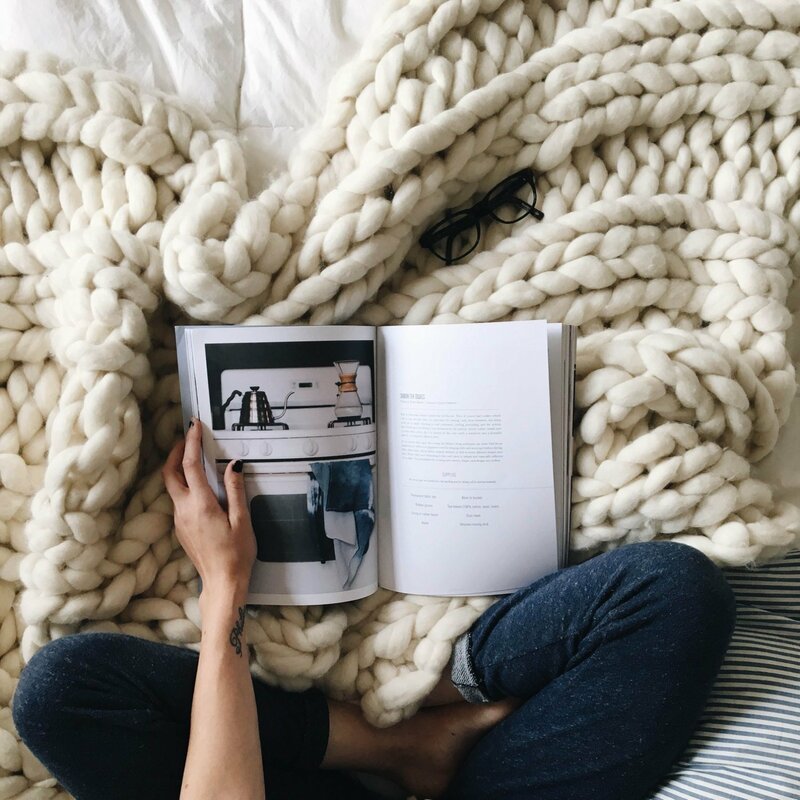 Here are a variety of options for buying or making your own chunky knit blanket. Although it's hard to believe, it's almost that time of year when holiday parties start occupying most weekends. Most people's go-to gift for these kinds of events is usually a bottle of wine, but sometimes it's nice to surprise your hostess with something different. Here are 60 fantastic DIY hostess gifts that you can start thinking about ahead of time to avoid excessive holiday stress. Make quick and easy paper roses!